Thunderbird is a cross-platform e-mail client from the makers of Firefox. It is free, safe, lightweight, and fast software to manage multiple accounts with ease. The installation process is quite easy, after which you can get started with managing your e-mail addresses. 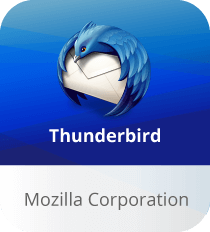 Mozilla Thunderbird boasts a modern looking yet user-friendly interface that focuses only on the most important features through a few menu options. Some of the popular features such as writing a new mail, chatting or search options are available from the quick access toolbar. When it comes to security, Thunderbird is no less than others. The e-mail filter blocks malicious content and the anti-phishing feature prevents your password and other private data from being hacked. The security engine also includes digital signatures, certificates and encryption for Internet privacy. The communication utility lets you chat with your friends in an easy and convenient manner. You can add new contacts to the list, join a chat room, as well as change your status. The messaging software supports various chat programs such as Twitter, Google Talk, IRC, XMPP etc. What’s more, the Windows software is highly customizable. You can add new features via extensions that are available in the Add-ons Manager. The overall look and feel can also be modified by using themes or skins. Download Thunderbird for all your emailing needs and accessing multiple accounts at the same time. Managing your email accounts with Thunderbird email messenger is quite easy. You can open messages in multiple tabs, use labels to indicate important messages, read news, and a lot more without ever leaving its interface. WOW ! It includes tabbed e-mail, message tagging, new search tools, indexing, smart folders, Support for Firefox's Personas, a simplified setup wizard and many more.